Fifteen years ago the entrance to Nizhniy Novgorod (then Gorkiy city ) was strictly off-limits to foreigners. This beautiful and ancient city also happened to house military manufacturing plants and scientific research centers, the sort of attractions normally not listed as must-see tourist attractions with the local Chamber of Commerce. 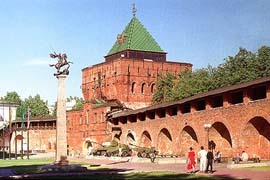 Nizhniy Novgorod is an ancient city founded at the beginning of thirteenth century. 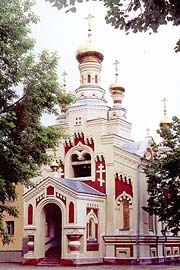 The Second World War had not reached it (factories were only occasionally bombed by fascist planes), and the majority of churches, monasteries, and merchant houses remain intact. 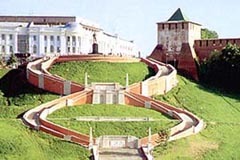 Initially, the entire city was located behind the walls of the Kremlin, an unassailable fortress made of red brick, constructed on a huge hill. Today, the Kremlin is still located on the same hill, and as grand as ever! 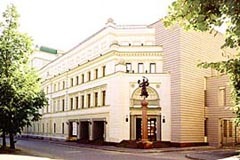 Today there are more than one and a half million people living in Nizhniy Novgorod, there are more than ten institutes and universities, famous theatres, art galleries, museums, and succeeding enterprises such as the Nizhniy Novgorod Fair, well known throughout Russia. 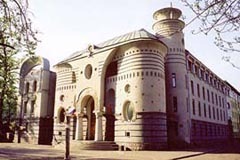 Due to its size and importance, it is often referred to as "the third capital of Russia". 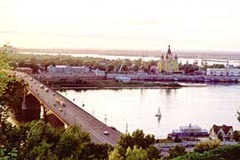 Nizhniy Novgorod is home to numerous tourist attractions including the two largest Russian rivers, the Volga and the Oka. (These two mighty rivers converge on the city and flow as one. 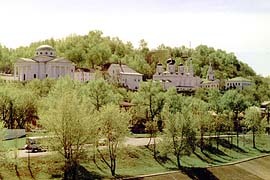 The city is located on hills, overlooking the majestic rivers.) 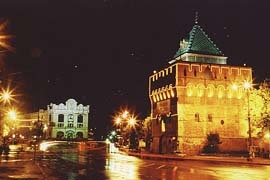 The historical downtown area is small, however it is possible to stroll about the streets for hours. There is no shortage of loving couples strolling along the Verhnevolzhskaya embankment. Most declarations of love are rumored to take place exactly here: the beauty of a huge river and shady avenues make for the perfect backdrop. You will find some of the most beautiful women in the city walking along the popular "Big Pokrovskaya" street. This pedestrian street is about two kilometers long and considered the most popular place in Nizhniy. The most expensive shops, cafe, bars, and best restaurants (the majority feature Russian cuisine, but you will also find Mexican, Chinese and Georgian) are situated along both sides of the street. All the ancient buildings have been restored and painted bright colors - making it the most cheerful street of the city. Each evening you will find it filled with people enjoying the art exhibits, street performers, or just taking a casual stroll with that special someone. One of the most popular attractions of "Big Pokrovska" is the free "Fashion Show", arranged on a daily basis by beautiful single girls. 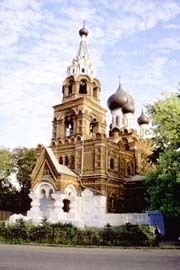 In short, each visitor will discover something special in Nizhniy Novgorod. Peaceful moon-light sails along the rivers, monasteries, churches, narrow ancient streets, wide prospects, cozy small restaurants, modern night clubs - there are choices to suit every taste. 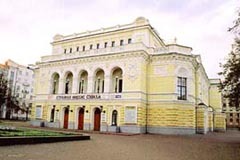 In fact, UNESCO recognized Nizhniy Novgorod as one of the top 100 cities representing a world cultural value. 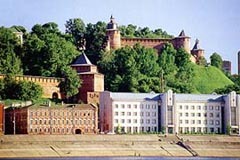 View of Nizhniy Novgorod Kremlin from river Volga Strelka. Confluence of Volga and Oka rivers. 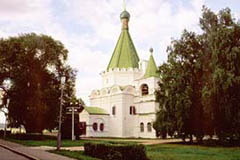 Volzhsky Otkos. Embankment. 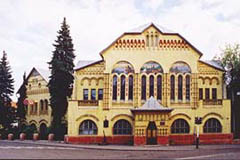 State Bank. House of Junior creativity. 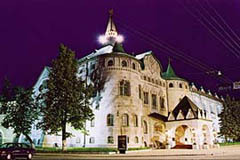 Comedy Theater.